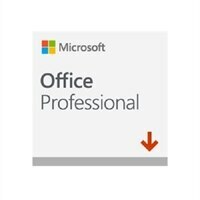 Microsoft Office Professional 2019 - License - 1 PC - download - ESD - Win - All LanguagesOffice 2019 Professional includes the apps you need to get more done and work from virtually anywhere. Start a document on your laptop, then revise it on your phone or tablet. Work with your colleagues to review and make edits and see them in real time. With Outlook email, shared calendars, and task-list tools, you can manage schedules, and keep your business running smoothly. Office 2019 Professional includes the apps you need to get more done and work from virtually anywhere. Start a document on your laptop, then revise it on your phone or tablet. Work with your colleagues to review and make edits and see them in real time. With Outlook email, shared calendars, and task-list tools, you can manage schedules, and keep your business running smoothly.